Starring Dakota Fanning, Guy Pearce, Carice Van Houten and Kit Harrington. A frontier woman turns fugitive when she is wrongly accused of a crime she didn’t commit and is hunted by a vengeful preacher. An ingenious conglomeration of narrative complexity, Koolhoven’s audacious film Brimstone is tense, authentic and absolutely brutal. A lot can be said about Brimstone; its narrative arrangement emphasises both the audience and the protagonists’ necessity for retribution, the striking visuals of the Western landscape captivate your attention and the acting relentlessly wrestles with your emotions. 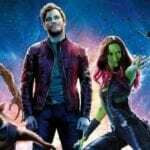 The dialogue is well written and emotionally engaging, similar to that of Tarantino, despite falling flat in some areas that were clearly postured to highlight the humour in the absurdity of some Western clichés’. The film seems to monitor its own narrative pacing, choosing to reveal the horrific history between the two opposing characters, Liz and The Reverend, by slowly transforming the suspension established in Koolhoven’s first chapter into justified aggression, pushing the film’s narrative to the edge of great storytelling. Running in at 149 minutes total, the length of Koolhoven’s film is driven in equal measure by the tension inherent in the narrative’s structure and the need to tell Liz’s story of revelation, exodus and retribution. This need becomes more evident as the history between each of the characters unravels after the first chapter. Between each chapter, there exists a well-defined fluidity connecting our understanding of the protagonists’ history to the curiosity that arises from the sympathy we hold for her condition. 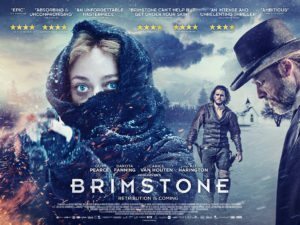 Perhaps unique to the Western film genre, Brimstone boastfully explores the Western genre from a female perspective. Held within the confines of America’s 19th-century frontier patriarchy, Liz, and any other female character for that matter, are unjustly limited to serving the needs of the men in the film in every facet. I would argue that Koolhoven’s use of ultra-violence within this context is perceived and endorsed as a sign of authenticity, and rightly so. The authenticity of violence in Brimstone is a necessity because the acts, tradition’s and beliefs of the 19th century appear barbaric in the context of our society and demand a response equal to that of the harshness first given. Koolhoven seems to emphasise the violence of the time to contrast how we perceive violence and gore today to justify Liz’s response. The genre of Brimstone is multifaceted and lacks any clear definition, something that can also be seen in the cast, crew, locations and the cinematic tradition it embellishes. The film introduces itself as a horror and then shifts flawlessly into a Tarantino style retribution flick, before regulating itself as a more historically dramatic film akin to Alejandro González Iñárritu’s The Revenant. Much like The Revenant, silence is utilised to accent what is unknown and suspenseful. It plays upon the tension of the narrative while also forcing you to enter into the same frustrations Liz contains, due to her lack of a tongue. Visuals are instead the focal point of Koolhoven’s film. The distant and vacant landscapes breathe a believable solidarity into the film, complementing the limits of Liz and the confines of her situation. What makes Koolhoven’s film ingenious is how he wonderfully destabilises these ideas’ one at a time in an effort to reverse the power structure, much to the same effect of how he reverses the cliché of the Western male saviour. These moments of revelation are evenly spaced throughout the length of Koolhoven’s film and generate a consistent interest that rarely withers. The acting is pivotal to this interest in equal measure and compliments the film’s tension and pacing greatly. Both Dakota and Pearce appear to be performing to their highest capabilities. The narrative strength of Koolhoven’s heroine drives most of the momentum behind Brimstone. Its bloodlust and carnival Western attitude overshadow the small faults, plot holes and oversights that are few and far between to pick out. The biggest issue with Koolhoven’s film is that it loses a small amount of its momentum in the run-up to The Reverend’s conclusion, something that the entire film is built around. However, this appears trivial because the structure built around this crescendo ends up being the most memorable and enjoyable part. Brimstone consistently builds upon it’s self-defined quality making for a disturbingly tense viewing experience.